O F F W I N G 3 B E Y O N D T H E X ' S A N D O ' S PHOTO BY USA Hockey Magazine Archives Pride In Your Community The hockey culture has always h a d i t s r o o t s i n t h e c o m m u n i t y and that's why it's important to be visible in the community. Remind your players that they 're not only representing themselves, on and off the ice, but also their family, their association and their community. T h e y s h o u l d w e a r t h e i r t ow n o r association colors with pride and feel like they're part of something bigger than themselves. 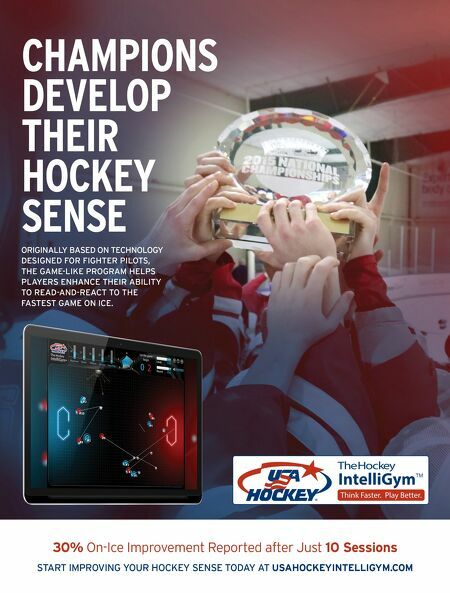 P Joe Bonnett is a regional manager with USA Hockey's American Development Model. Close To Home One thing I really like is to have clubs encourage their older players (14U, 16U) to serve as mentors for younger teams (8U, 10U). Having the older players coach younger players creates role models that they can look up to and helps create a winning culture throughout the association. Have Fun Doing It Performing community service doesn't have to be a grind. When I was growing up in Michigan, my hockey team would gather at our coach's house to eat hot dogs and d r i n k h ot c h o c o l a t e b e f o r e w e 'd shovel neighbors' driveways. These types of team-building events away from the rink not only made our team stronger when we hit the ice, they were fun. Go In With A Game Plan E s t a b l i s h i n g v o l u n t e e r requirements early on helps create the right culture out of the chute. Stress to your players the impor- tance of giving back, whether it be volunteering as a coach or getting involved in the community. It's a good life lesson that will stay with your players long after they hang up their skates. Stay Humble Hockey players, by their very nature, are humble people. As the old expression goes, "There's no I i n t e a m ." T h a t m e a n s a l w a y s putting the needs of the team over t h e i n t e r e st s o f t h e i n d i v i d u a l . That starts in the locker room by encouraging players to focus on team goals instead of individual accomplishments. That mindset will carry over into the community. There's Always Something To Do The possibilities to get involved in your community are endless. Whether it's hosting a clothing or food drive or volunteering at a local children's hospital or retirement center, find something that hits home with your players and go for it. A ny coach will tell you that c r e a t i n g t e a m c h e m i st r y and cohesiveness is essen- t i a l t o a c h i e v i n g o n - i c e success. And establishing a win- ning culture in your locker room includes what you do away from the rink. By encouraging your players to give back to the community, you not only make the world a better place, you help establish stron- ger team bonds that will carry you throughout the season. 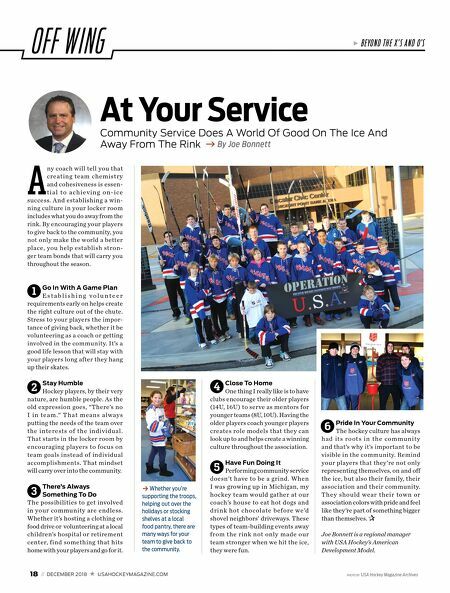 1 2 3 4 5 At Your Service g By Joe Bonnett Community Service Does A World Of Good On The Ice And Away From The Rink 18 // DECEMBER 2018 USAHOCKEYMAGAZINE.COM 6 k Whether you're supporting the troops, helping out over the holidays or stocking shelves at a local food pantry, there are many ways for your team to give back to the community.